I’m having a blast at the ethnic grocery store right down the street from my house. The place is always packed, and the prices are way better than most grocery stores. Since it’s a heavily trafficked store, I know the turn-over is great. Fresh, fresh, fresh! I picked up some fresh tahini (if I told you the price, you would slap yourself—no more $18 tahini at Whole Foods, thanks!) with the intent to make hummus. For some reason, all I can stomach for breakfast lately is hummus, vegetables, a hard-boiled egg and a glass of milk. It’s weird, but I’m going to ride it out because it sounds healthy. I will admit to stepping into Whole Foods long enough last week to grab their flyer. I’m hooked on the money-saving recipes in their monthly flyers, however ironic they may be (I have a recipe for saving money: shop somewhere else. I kid, I kid. I love WF). Anyway, a recipe for sesame chocolate chip cookies made with tahini jumped off the page. Why have I never thought of this? Then, I saw Dula Note’s Tahini Swirl brownies and just about died. Those are next, my little pretties. I’m not about to claim this to be a healthy cookie. People ask me all the time about how I eat. It’s the most personal question I can think of, and it’s really best if you just come to my house for dinner so I can show you. I would say the diet I align with most is the Mediterranean diet. But, I have a strong love for ethnic foods, too. One of my New Year’s resolutions is to make more Indian food at home. I couldn’t quite define my eating habits until this month’s Rachel Ray magazine. Gabriella Gershenson wrote an article entitled ‘The New Mediterranean Diet’ that captures the foods from the entire coast that touches the Mediterranean Sea. Not just southern Europe anymore, her definition includes north Africa, the Middle East and a slip of Asia. Now, THIS is how I eat. I eat lots of lean proteins, vegetables and whole grains, but with heavy North African spices and Middle Eastern Flavors. And if I don’t have some variation of Asian food once a week, you can find me in the fridge with a spoon in the red curry paste jar. (Don’t try that). Maybe it doesn’t bother you to not be able to clearly expound upon your diet, but it was making me fret. I felt like I was dodging the question with my vague answer: ‘oh, I eat mostly healthy, but I do shove a cupcake in my pie hole on the reg’. Or, is it pie into my cupcake hole? The one way my diet unmistakably differs from the Mediterranean diet is dessert (duh!). While the new Mediterranean diet touts dessert to be strictly dried fruits and nuts, I’m all GIMME THE CHOCOLATE over here. I eat lots of dried fruits as snacks, not dessert. This leaves plenty of room for a warm chocolate chip cookie. If you’ve never cooked with tahini, try it! It’s just pureed sesame seeds—you know, the ones on your hamburger bun? They’re nutty and slightly sweet. And they’re gloriously gooey in chocolate chip cookies. Let’s do this! In a medium bowl, beat together with an electric mixer on medium the tahini and butter. Add the brown sugar and beat well, until fluffy, about 30 seconds. Next, add the egg and vanilla and beat until combined. Sprinkle the flour, salt, baking soda and baking powder evenly over the mixture, then beat until just combined--do not over-mix. Finally, stir in the chocolate chunks with a spatula. Make 8 scoops of dough on the cookie sheet, and sprinkle each cookie with a bit of the toasted sesame seeds. Bake for 9-12 minutes, until the edges are starting to brown. Let cool on sheet pan for 1 minute, and then move to wire rack to cool completely. About tahini: The brand I use is 100% natural tahini. The only ingredient is sesame seeds. No salt. Nothing but ground toasted sesame seeds. Love the way that you describe your diet – it’s very similar to the way we eat (dessert included) and this is such a great articulation of that philosophy. Also love these cookies; I’ve not tried tahini in baking yet but I’m intrigued! I love all the fun flavours in these cookies. Tahini and chocolate?! Yes, please! YES! I’ve been wanting to make tahini cookies! I wish we had a good ethnic food store in our lil town…it’s definitely expensive stuff, but I just can’t not buy it. So with my jar o’ tahini, I’m ready to go with these cookies. Bring on them chocolate chunks! I’m down for some delicious ethnic food and tahini cookies for dessert! Ooo, I bet that tahini is so good in a cookie! I need to make these soon! Such an interesting cookie! I’m trying to wrap my head around this flavor combo…guess the only way to know is to make them!! Christina, this is genius! 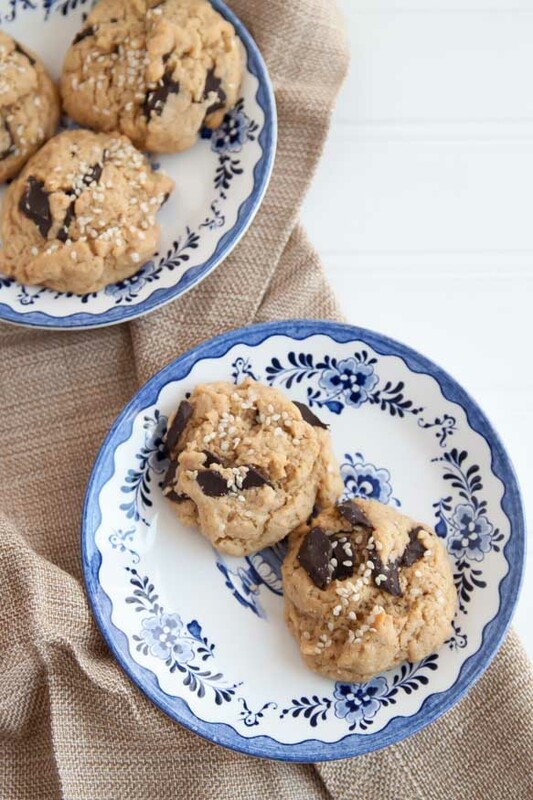 I never know what to do with leftover tahini and I love the idea of cookies. I adore tahini but have never baked with it before. What a great twist on a classic cookie! Not much better than a warm chocolate chip cookie! i still haven’t dipped into the tahini in baked goods situation, but I’m sooo ready to try it! I love ethnic markets as well. The first time I bought ginger from one I thought, “So THIS is what fresh ginger is!” I’m intrigued by these- can’t wait to try them! These look just great! I love tahini in my baked goods and this also seems perfect. 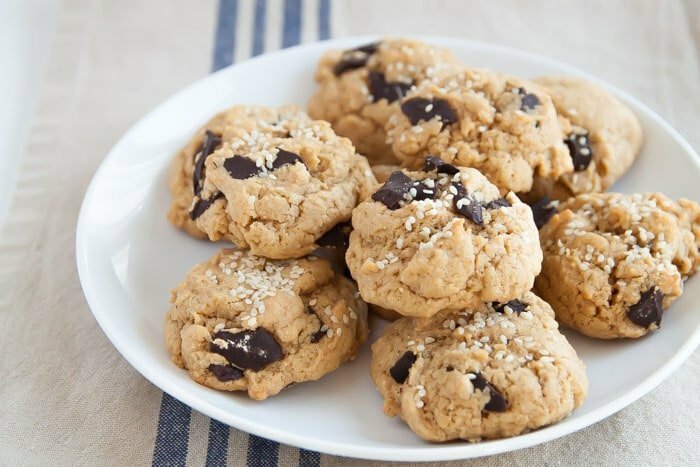 I love tahini in baked goods, it adds such a great flavor and these cookies look amazing. I eat very well most of the time as well, but when it comes to chocolate……..
Yum! I know the tahini gives them a nice nutty note. I am so intrigued by the tahini! I have never tried that but it sounds wonderful!! The Mediterranean Diet also insists upon a glass of red wine every day with dinner. Don’t forget that! I LOVE tahini…mainly because I grew up on it..haha And we also shop at the Mediterranean market too because it’s way cheaper in a lot of things. Funny, I work at WF and some things are crazy expensive but some arent if you get the sales..lol I need to make tahini cookies…And where did you get those gorgeous plates!!!? haha! let me reiterate again how much I love Whole Foods, Samantha. I go there for stress relief. having a bad day? Whole Foods makes it all better. It’s my therapy. I do agree with you–some things are totally reasonably priced. especially the 365 brand. Bad news about the plates–they’re my grandmother’s. I inherited them years ago. I wish I had a better source for you. They say ‘Johnson Brothers Holland’ and ‘made in England’ on the bottom. I’m sure they were super cheap back in the day. Try Ebay? I had to laugh when I looked at the plates and saw they were the first set I ever owned. I got them when I bought a set of really good pots from a door to door salesman. My son bought me a suit set of pots so I gave them to my nephew who is using them while away at collage. Anyway, the table ware was a throw in when you bought the pots. We are talking over 40 years ago! I never know what to do with the last bit of tahini! Such a great idea to make cookies with it! Love it! I love Whole Foods, but everything priced there makes my soul weep. I also have no idea what Tahini is, but it sounds like an exotic island where I would like to go and eat these cookies on the beach. You’re invited, btw. I am so on your page with eating. Healthier eating regularly means dessert is completely acceptable. 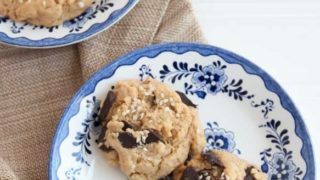 Love these cookies, I must try them (the tahini in my fridge is calling my name)! I’ll take the cookie closest to the bottom right, with the extra large chocolate chunk, please and thank you! 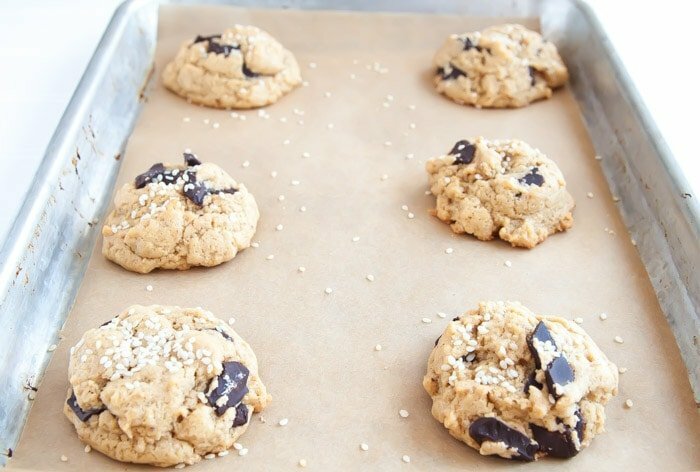 I’m super intrigued and loving the idea of adding tahini to my cookies! Great photo! Tahini in dessert makes perfect sense to me! Keep it comin’! Those look like some yummy chocolate chip cookies, great job! The NEW Mediterranean diet definitely sounds like how we eat also! With some Mexican food thrown into the mix. :P I love the tahini infusion in these. Like PB+choc cookies but cooler. Ooooh how interesting, sounds wonderful! I have some tahini, and am always on the hunt for nutritious ways to bake for my training. Now I have another healthy cookie recipe! Yum! Thanks! Ooh these look and sound divine! I’m going to try to adapt them without regular flour and see how they go! I am blown away by these cookies. They look too good to be true – I wouldn’t mind taking a couple of these off your hands :). I am so jealous whenever people talk about Whole Foods. I’ve never been to one since there’s none close by, but ethnic grocery stores? I can definitely find some of those! Seriously can’t wait to make these! Um, these sound amazing and I must make them immediately!! Can’t wait to try! I love Whole Foods too, but you’re right, they are pricey. These cookies are so unique. Love! Pinned. I love tahini! I eat it plain sometimes, is that weird? I don’t eat everything, but almost! So it’s impossible to tell someone how I eat — it depends on the season, and what I feel like. And at the moment I feel like one (OK, three!) of these cookies! Good recipe — thanks. Which ethnic store do you go to?! I live in Creve Coeur and love finding new places to buy groceries. I’M GOING TO HAVE TO TRY TAHINI IN MY COOKIES, SOUNDS AMAZING! Such a great idea! I was just buying hummus at Whole Foods this week because I never can bring myself to buying a big container of pricey tahini and not knowing what to do with it all. I’m so intrigued by the sound of these! I love (LOVE) tahini, but have never tried it in a sweet recipe, now that I think of it. I stock up on huge jars at the local Middle Eastern market, and totally need to hit them up for a new jar so I can make these. Yum! These are genius! I’ve been on a sesame kick lately, too – yum! Thanks for sharing the recipe. Can’t wait to make them. Love the small batch, too. love the idea – especially a small batch, and since I am off chocolate temporarily, I am going to substitute either dried cherries or cranberries! Fun flavours. I slightly reduced the sugar and used dark brown with no harm. Probably a 10% reduction but will have to make another batch to verify that! Lovely use of tahini – which often hangs around too long since I only use it in a few things. Just made these cookies a day they are PERFECT!! Not only do they look beautiful, they taste heavenly too. So easy to throw together, with ingredients I had on hand in my pantry and I’m so glad I stumbled upon this recipe. Thank you so much :) p.s: I didn’t have any sesame seeds but the cookies still turned out beautiful. Also, they puffed up and had a gorgeous crackly top! I used a tablespoon of dough per cookie and ended up with 12 perfect cookies.